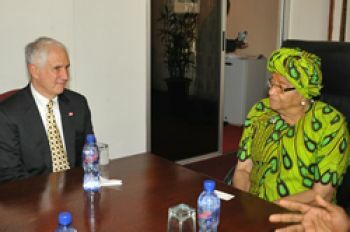 President Sirleaf chats with Mr. Joel Lamstein, President, JSI Reseach & Training Institute. Monrovia, Liberia - President Ellen Johnson Sirleaf on Tuesday, April 23, 2013, received a four-person delegation of the John Snow Incorporated (JSI) Research and Training Institute, headed by Mr. Joel H. Lamstein, its President. In his statement, according to an Executive Mansion release, Mr. Lamstein extended greetings from Boston, the home of JSI. He recounted an earlier meeting with the Liberian leader, and thanked President Sirleaf for her support to the work of JSI, and the PYP Fellows Programs. JSI has worked all over the world with different kinds of experiences, Mr. Lamstein said, but has gotten true support and partnership in Liberia than anywhere else in the world. He promised President Sirleaf that the JSI Liberia Programs will continue. For her part, President Sirleaf indicated that JSI has been very successful in Liberia and that many of the products of their interventions who came to Liberia are placed and doing very well in many government institutions. She acknowledged that the PYP Program has seen a transition that now focuses on recruitment, training and mentoring. “I look forward to the finalization of the PYPP Transition Strategy and the signing of the Transition Document by the relevant government institution”, President Sirleaf stated. The finalization of the PYPP Transition Strategy will lead to the formal signing of a Memorandum of Understanding for a proposed five-year plan for the Program’s transition from donor-support and management to full Liberian ownership. Under its healthcare intervention, JSI worked with the Ministry of Health and Social Welfare on service delivery, health system strengthening and community service work; was involved with the five-year National Health Plan developed by that Ministry; and is currently associated with the development of a 10-year health plan for Liberia. Other members of the visiting JSI team were: Mr. Theo Lippereld, Deputy Chief of Party/VP for International Decisions; Mr. Frank Defarbo, Project Director; and Dr. Rose McCauley, Chief of Party, RBHS. Accompanying the delegation was Mr. Saah N’Tow, Program Director of the Liberia Fellows/President’s Young Professionals Programs.